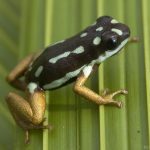 This species is only known from the type locality, the conservation concession of Lago Preto Paredón which is located in the central drainage of Rio Yavari close to the mouth of Rio Yavari-Mirin, Loreto, Peru, 80 m elevation. 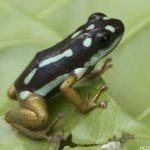 Nevertheless, we believe this species may occur in other localities near the Tahuayo-Yavari interfluve and western Amazonian Brazil. 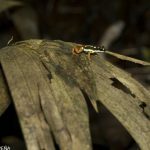 This species has reproductive behavior very similar to other species of Ranitomeya; it deposits eggs in bromeliads (although only one tadpole has been found which was in a bromeliad in the forest understory). 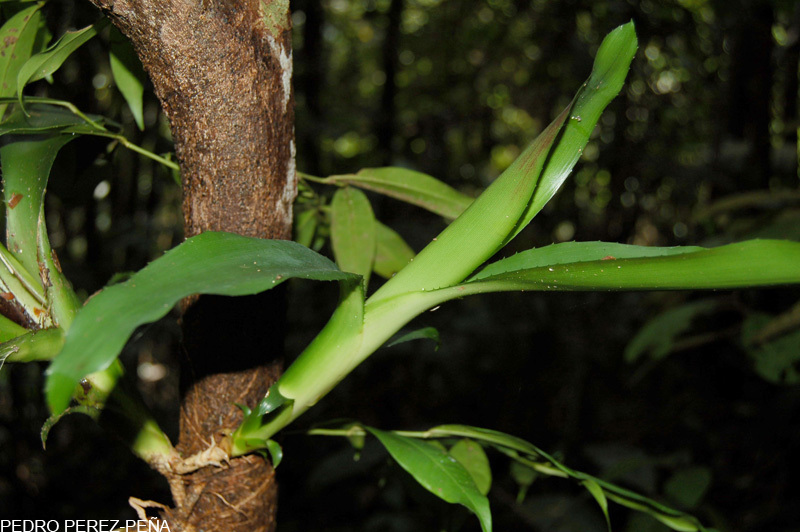 This species primarily inhabits terra firme (non-flooding) forest, although it can be found on the edges of aguaje swamps and seasonally flooding forests, especially in habitats dominated by Geonoma palms. Adult males vocalize from leaves and branches of small shrubs. Adults are very shy: typically when encountered they jump to the ground and hide in roots or leaf litter, or remain perched underneath leaves. It is easy to observe males during call playback experiments, where males respond to call recordings. 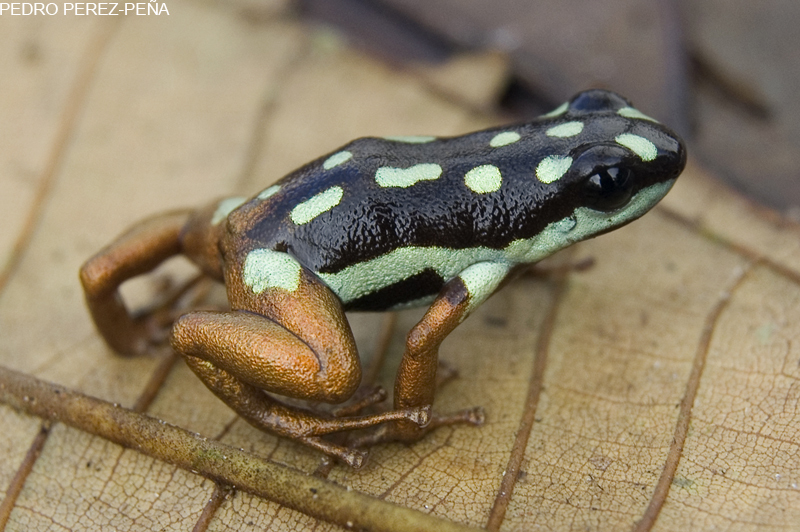 The call is very similar to that of Ranitomeya biolat, a species from southern Amazonian Peru. The duration of the call is approximately 0.76 seconds (based on an average of 7 males during 16 minutes of recording. Following IUCN criteria, this species is listed as Data Deficient (DD). 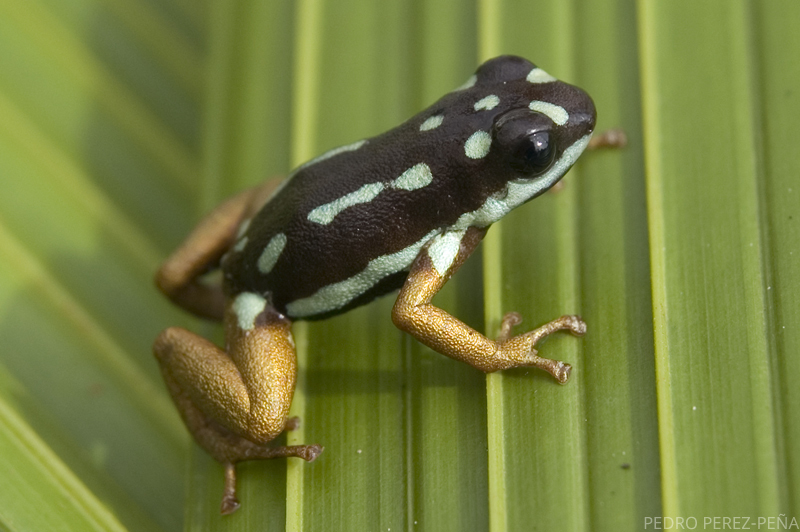 At the moment, their habitat in the Yavari drainage is well-conserved. 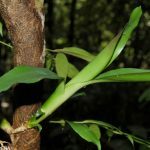 However, in the Yavari-Mirin, where this species may also occur, there have been several logging concessions which could eventually eliminate many habitats of this species. 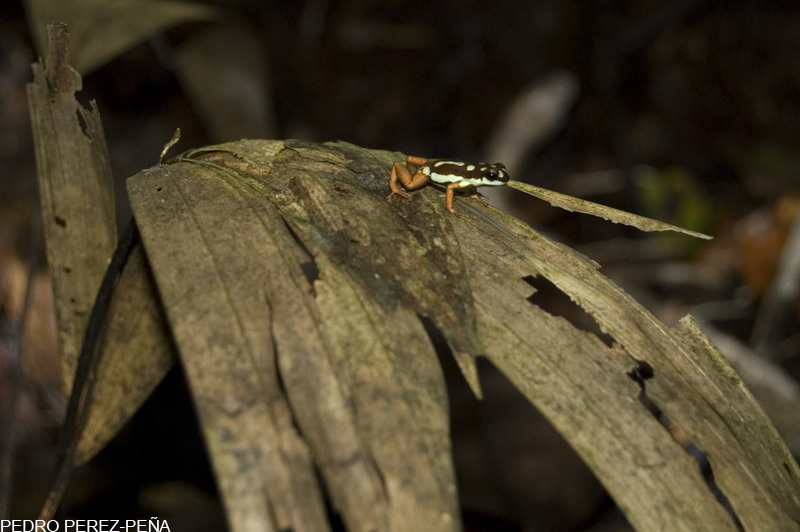 In the upper Rio Tahuayo drainage, several species have been smuggled, including Ranitomeya uakarii, R. flavovittata, and R. variabilis, although local communities have taken some measures to reduce these activities. 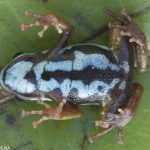 In the upper Yavari drainage, we have one record of a frog very similar to R. yavaricola (Gordo et al., 2006), but which differs in that it has white dorsal stripes and a yellow labial stripe, and furthermore the extemities are bronze but have vestiges of black spots. 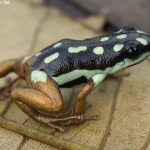 We consider this frog to be either a conspecific or a close relative of R. yavaricola. 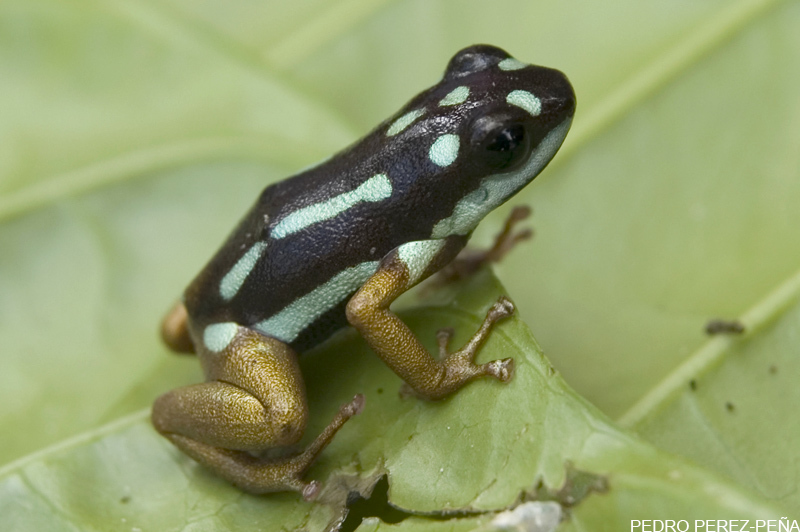 Phylogenetically, R. yavaricola is most closely related to Ranitomeya cyanovittata Pérez-Peña et al. (2010) and is a member of the vanzolinii group. 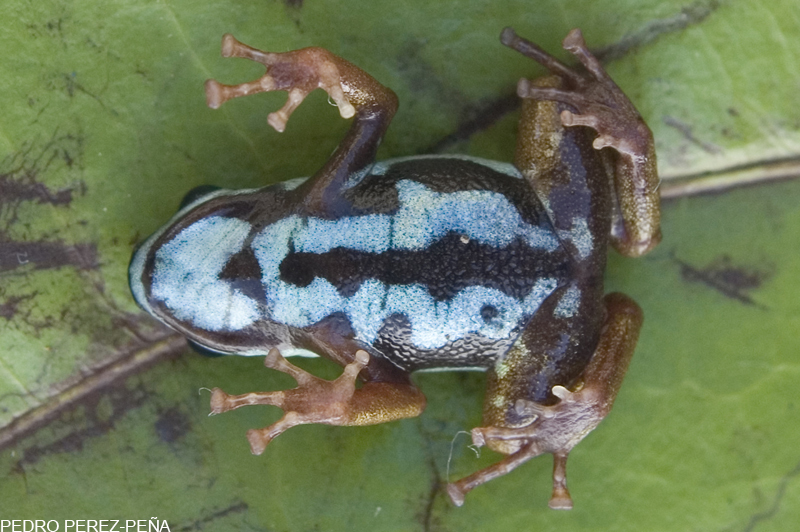 Note: the last photo is showing a bromeliad which contained a R. yavaricola tadpole. Gordo, M., G. Knell and D.E. Rivera-Gonzales .2006. Amphibians and reptiles. In: Vriesendorp, C., Pitman, N., Rojas-Moscoso, J.I., Pawlak B.A., Rivera-Chavez, L., Calixto-Mendez, L., Vela-Collantes, M., Fasabi-Rimachi, P.F. 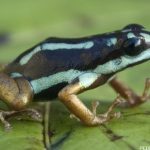 (Eds), Rapid biological inventory 16: Peru: Matses. The Field Museum, Chicago, U.S.A., pp. 191–196. Pérez, P.E. 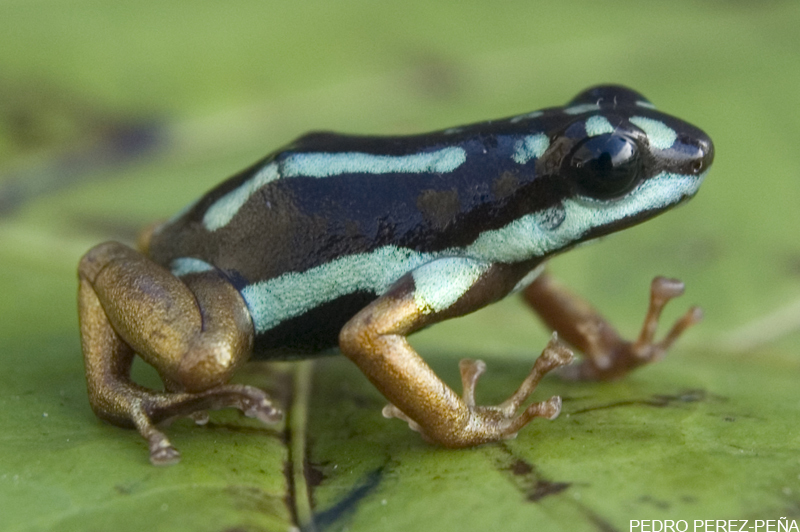 (2007) Finding frogs in the Peruvian Amazon. Wildlife Conservation, 2007, 14.